Create your own VR experiences or play one of 73 included games. 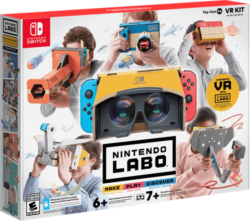 Following their announcement of the Nintendo Labo: VR Kit earlier this month, Nintendo has provided fans with some additional details about what the to expect from their latest cardboard venture. Pitched as a “family-friendly” VR experience, the Labo VR Kit boasts more activities than any of the previously released Labo kits to date. Once built, the Toy-Con VR Goggles forms the core unit of all the other VR Toy-Con creations. Simply slide in your Nintendo Switch to use the goggles by themselves or combine it with other Toy-Con creations to experience or variety of games on offer. Unlike other VR solutions, Nintendo’s offering doesn’t include a head-strap and relies solely on the player holding their creations in place while playing. Which may not sound ideal for long periods of time, but fits perfectly with Nintendo’s philosophy of providing a shareable and social VR experience that can be passed from player to player. In addition to using the headset directly, other players can also interact with the Toy-Con games without the need to own another Nintendo Switch. In certain games, simply grabbing hold of one of the “empty” Toy-Cons creations and stepping in front of the main player can create on-screen interactions that allow everyone to be involved. Nintendo provided an example of this, where a second person could use the Toy-Con Snorkel to make a “bug-eyed fish” swim towards and surprise the primary player. 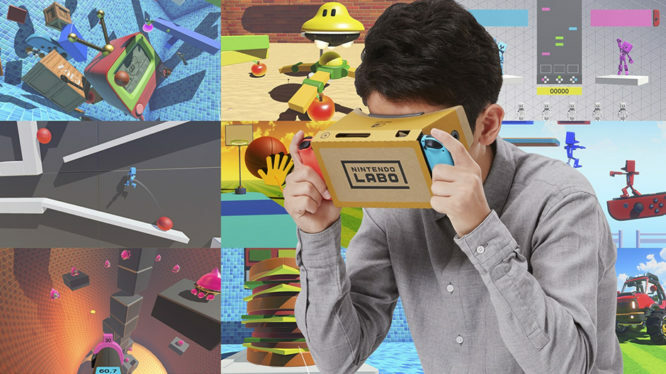 The Nintendo Labo VR Kit will come with 9 Toy-Con specific games/experiences and further 64 mini-games packed into the “VR Plaza” – which work with all the VR creations. Additionally, players will also be able to test their creativity and create their own experiences through the two programming tools (Toy-Con Garage and Toy-Con Garage VR) included in the bundle. The Nintendo Labo: VR Kit is set to launch on April 12th for $79.99 / £69.99 and is available to pre-order from Amazon right now.